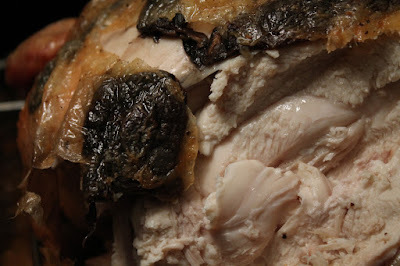 Sometimes an entree is only skin deep, which suits my Roasted Chicken with Portabella Mushrooms just fine. This earthy roast bird with mushrooms makes a delish dinner for the whole family, and if there is any leftover meat then shred it into a salad the next day. And it couldn't be easier to make. 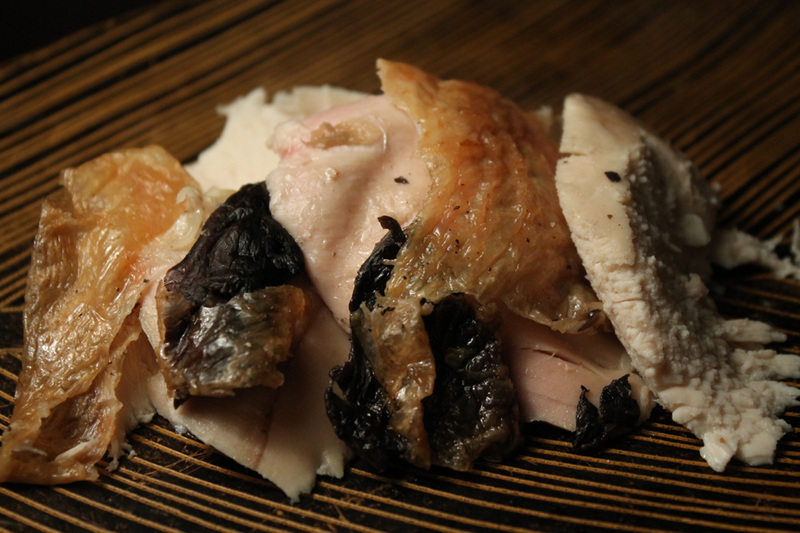 Just slide thick sliced portabella mushrooms under the chicken skin, season the bird, and roast it until done. While this cheap$kate recipe looks alien infected when it goes in the oven, the mushrooms cook down and the final presentation is a golden bird with brocade shapes of deep brown. It's a tasty combination. 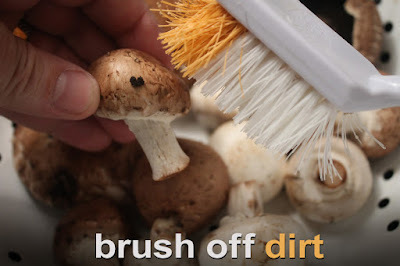 Use my recipe as a leaping off point and substitute any type of mushrooms you find on sale, including plain white button mushrooms. The trick to to slice them thick, so they don't dry out while roasting. For portabella mushrooms I like to scrape out the black powdery gills under the mushroom cap. Don't worry about getting it all out, though. Mushrooms always show up at my local 99c only Stores and chicken is the cheapest protein -- so go hog wild with this recipe. 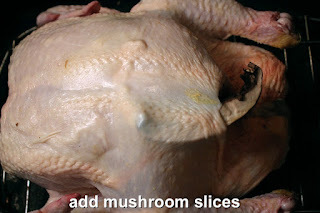 If leg quarters or whole chicken breast are on sale you can slide a few sliced mushrooms under the skin and bake them in an oven pan. 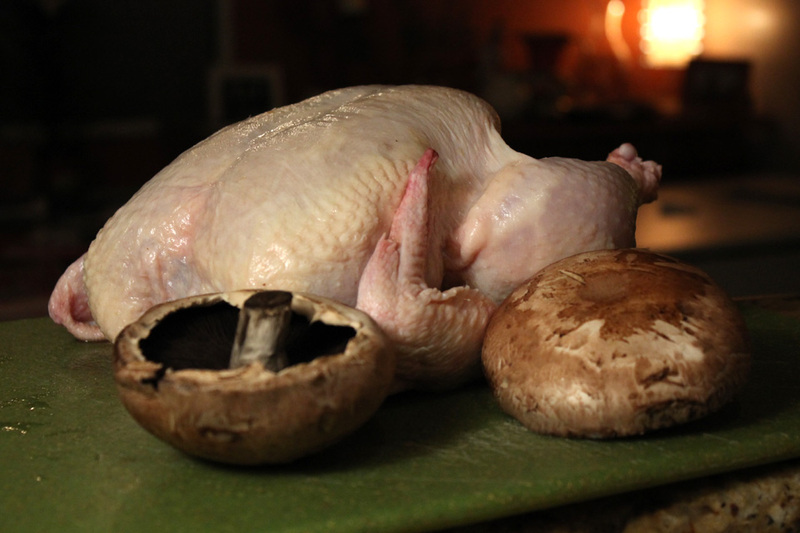 Moist mushrooms help keep breast meat from dying out, too. 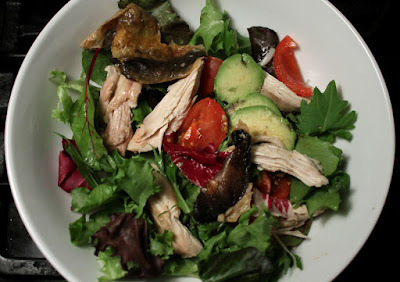 So next time you find fungi and poultry priced right, stock up and try my earthy Roasted Chicken with Portabella Mushrooms. 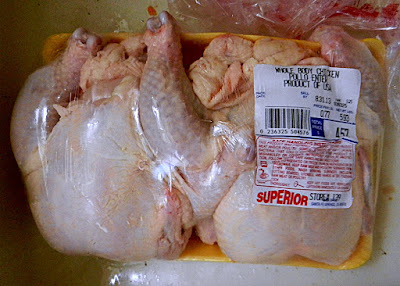 1 whole chicken - okay to use leg quarters or chicken breasts. 2 portabella mushrooms - depending on size. Thickly slice mushrooms. Okay to use button mushrooms or any you find on sale. Rinse off whole chicken and allow to dry for a few minutes. Brush off any dirt on mushrooms. Thickly slice mushrooms. 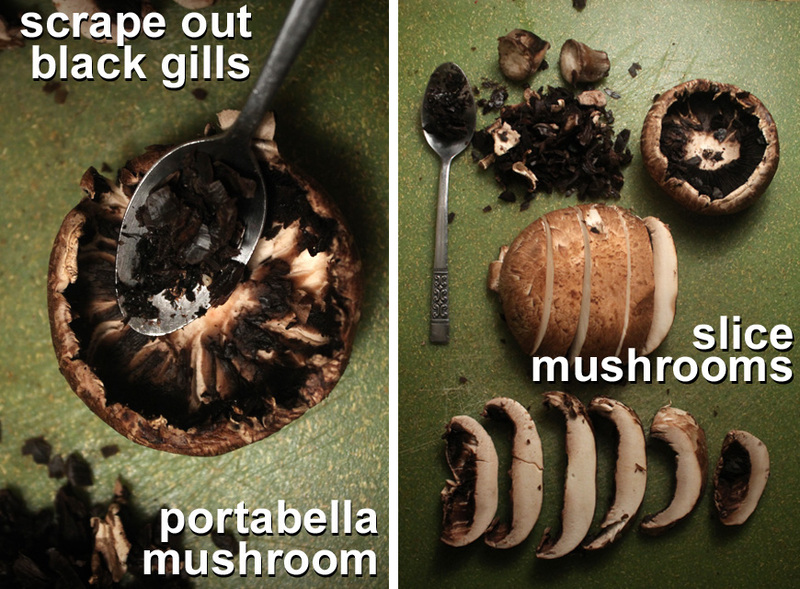 For portabella mushrooms, I like to scrape out the black gills underneath the mushroom cap. It is easiest to use a spoon. Be careful as mushroom cap will break. It's okay to add any mushroom pieces to chicken. The trickiest part of this recipe is to loosen the chicken skin. 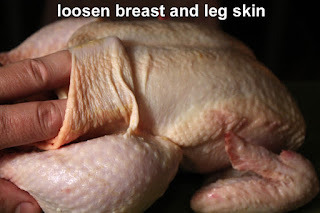 Wash your hands, then use your finger(s)and carefully slide them under the breast skin nearest the chicken cavity. Move the fingers left to right and press them forward to middle of the breast meat. If the chicken skin splits, that's okay. Hold it together and keep on loosening. 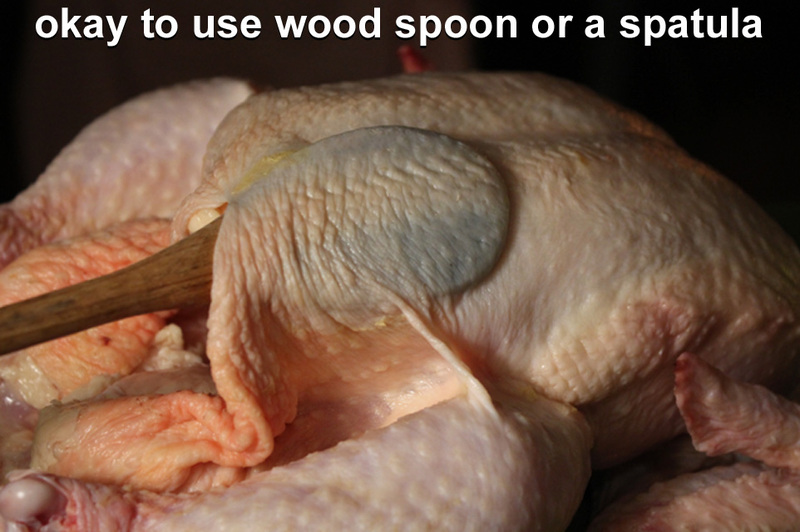 Okay to use a wooden spoon or plastic spatula. The breast skin is extra-attached along the middle of the breast bone, from neck to the cavity. You can separate it there, or just loosen skin on either side of breast. You can also enter the skin from the neck. I got about 4-5 slices on the breast meat. The leg meat is a little trickier. 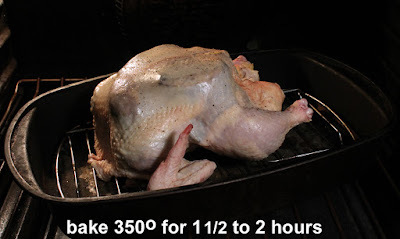 You can work your finger in at the base of the breast meat. You only need to loosen enough to get get one or two mushroom slices on the leg meat. If you can work your finger all the way to the thigh meat then add some mushrooms there, too. Once you've loosened chicken skin once, it gets easier next time, and you will want to keep baking chicken with other tasty ingredients just under the skin, like: lemon slices (or almost any fruit,) herbs and garlic. 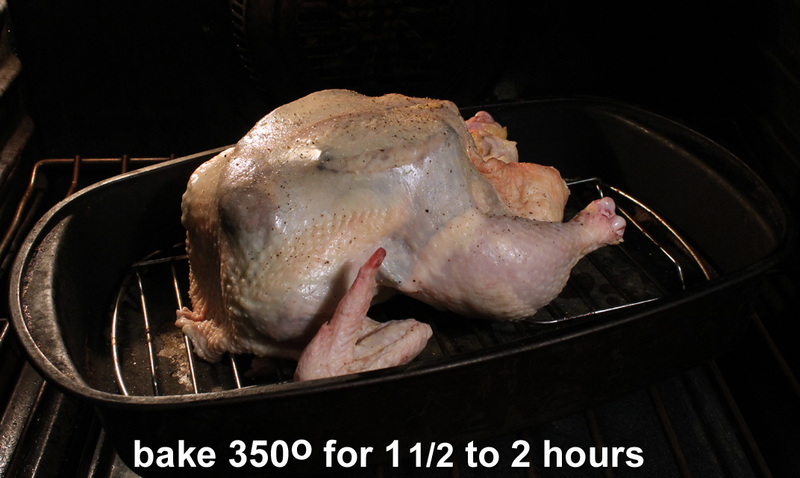 Bake chicken in preheated 350 degree oven for 1 1/2 to 2 hours. 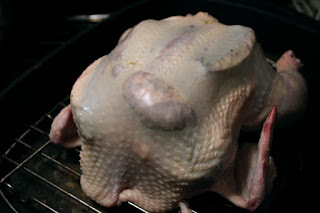 To keep breast extra moist, cover it with foil for first hour, then remove foil, and finish cooking chicken until done. Slice into dark meat to check for doneness. Chicken juices should run clear and the meat should not have any red showing.